It certainly becomes these beauties. "I never find anything too warm," said Cruella. "I wear furs all the year round. I sleep between ermine sheets. I worship furs, I live for furs! That's why I married a furrier." Tropes either partly or mostly about wearing fur, for good or for ill. Sometimes wearing fur is for warmth, and other times it's for Conspicuous Consumption. If a character wears fur, it's preferred that animals suffered for it. 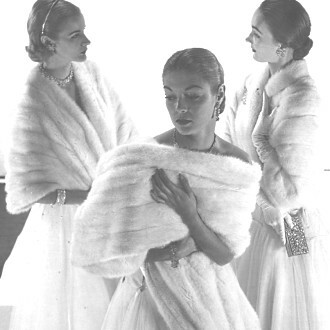 Using luxuries, like furs, to distract ladies. Wearing fur makes a character evil or stupid. A bikini made of fur. A swimsuit while wearing a separate fur garment. A grand dress worn around Christmas that quite often is trimmed with fur. We are assured that fur being worn is fake. A animal, usually fur-bearing, lays on you like a garment. Wearing a fur garment to hide being naked (even if temporarily). Rough furs and hides of stereotypical barbarians. An outfit for a pimp often is decorated with fur. Royalty gear often includes an Ermine Cape (whether ermine or another fur). Sapient creatures are skinned for clothing. A mini dress worn around Christmas that quite often is trimmed with fur.